One of my favorite things is reading so naturally lovely library spaces tend to draw me in. 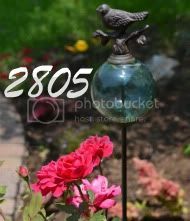 All photos available on my Pinterest Page with Sources. 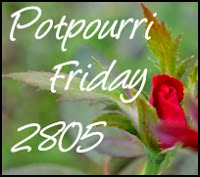 Hope you will join in the fun at Potpourri Friday! 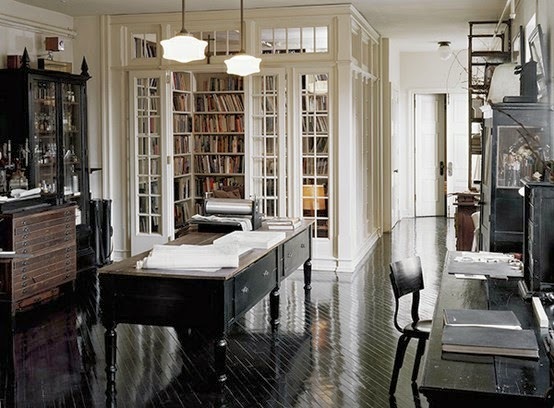 The loft libraries are really interesting but a dining room/library has always seemed more functional to me. I too love a good library. The one tucked under the stairs is such a great idea! Inspiring images! I have always wished for a library. I have to say the one under the stairs is clever. I agree with Andrea. I've often thought of drawers behind stair risers, but the library behind the stairs is the best idea yet! I love it, and wish I had a stairway in my house! These are all fantastic spaces...I love the one with the separate room...also the "comfy" one with the couch and chairs. Wouldn't it be lovely? I have books scattered all over the house on various shelves...to just have them all in one room!! I especially like the multi-function rooms. Perhaps we should all start thinking about multi-function in this age of downsizing that we all live in now.Great post. I love these! And would gladly take any one of them. Beautiful. Love these library spaces. They are soooo neat. I really love the one built into the back of the stairs. Now, that is really a clever use of space. 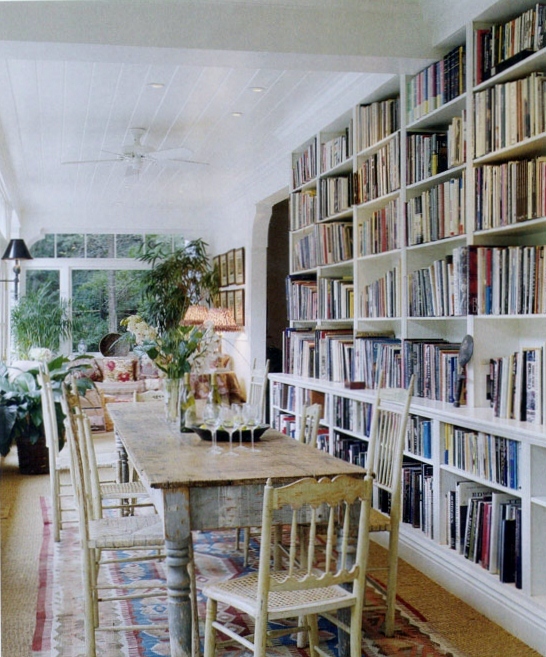 I have seen a lot of dining room librarys. That is also a great use of often under used spaces. All these libriary's are wonderful, love the circular one, but the under the stair one is so functional and a great use of space! I love it! These are lovely, Honey! I especially love the second photo! But the one tucked under the stairs is so clever! 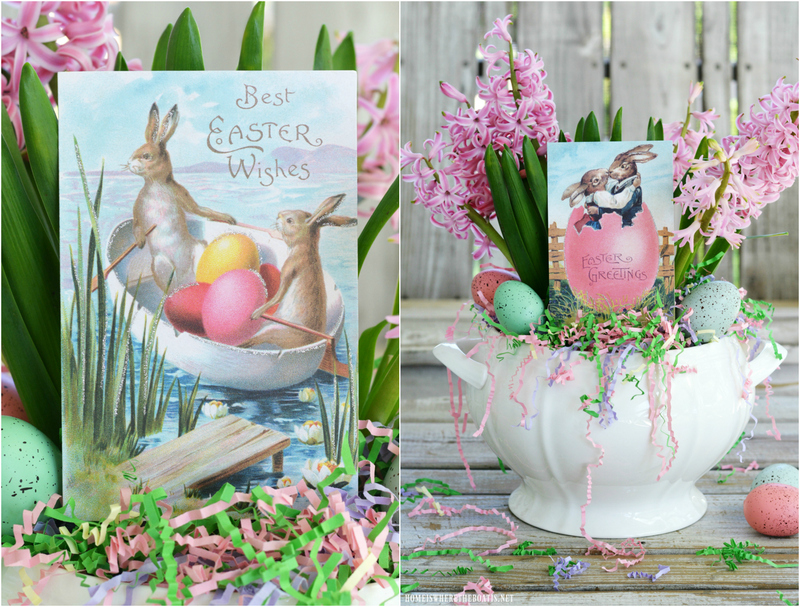 Thanks for sharing these with us! I loved them all! 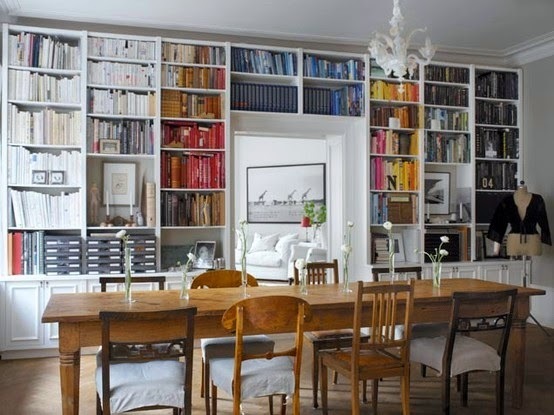 I love all the wood detail to them and I really like the dining room libraries. Very practical and that big old table would get used more than a few times a year! All so interesting and charming. There was a home that as a little girl I loved driving by at night because with the lights on, you could see the upstairs library with all the shelves filled with books. It was a huge English Tudor and I always said that I would love to live in that house because of the library upstairs. Wow Honey! What eye candy! 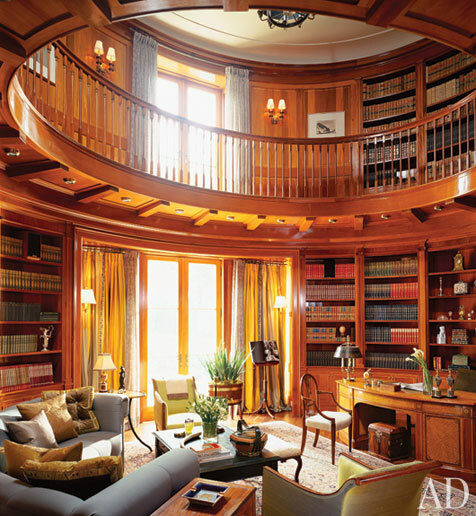 Beautiful collection of libraries, makes me want to curl up and read! I love library spaces too! 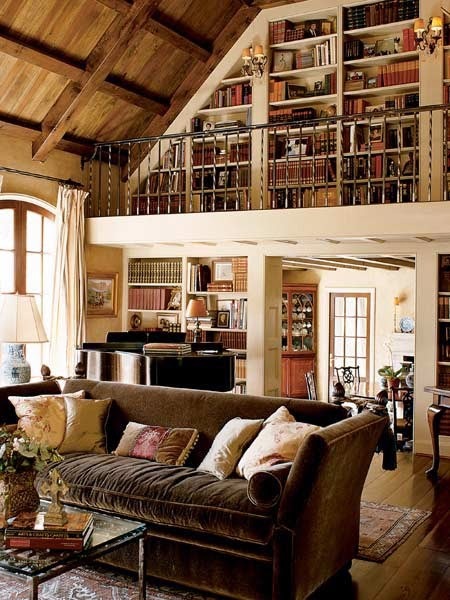 Books add something to a room like nothing else can. 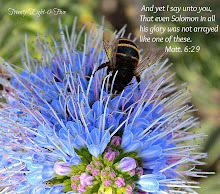 Great post with wonderful pics. 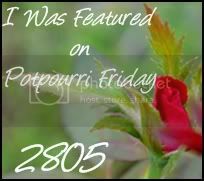 I'm your newest follower, signed up for email updates and will be participating in your Potpourri Friday party every week. Take care. Hi Hiney. Phew some gorgeous libraries here. 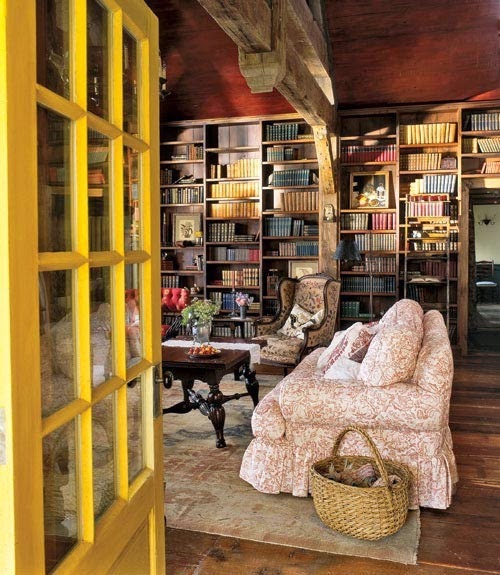 I think rooms like these with books always make me feel totaaly secure and comfy. I L.O.V.E. every one of those photos. We had a great library before we downsized. We will be adding a shelf area in our great room. Love the loft libraries! I love the romanticism of a library ladder. It always reminds me of the dark bookstore that Audrey Hepburn works at in Funny Face. Beautiful images! Thanks for sharing. I LOVE books and these libraries are fabulous! Those are all lovely spaces. I especially like the Rotunda library. Great places to show off our wonderful books. What a great round up of library inspiration. 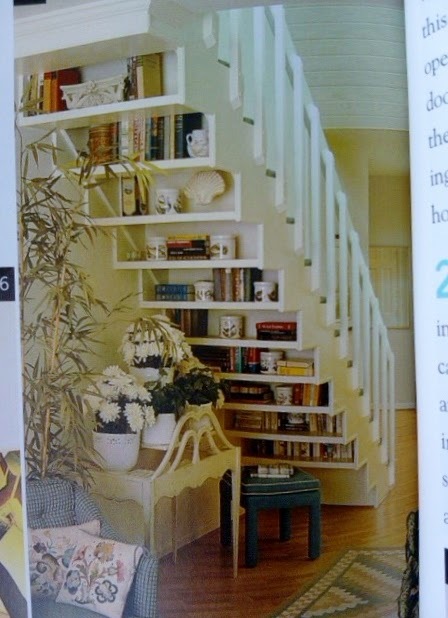 I'd love to have an amazing space like that, the shelves under the staircase is especially interesting! Oh my husband would love any and all of these rooms. My favorite has to be the room within a room. Thanks for sharing all these splendid libraries. I love a beautiful library! We have so many books at home our living room is starting to look like one too. My husband never met a book he could get rid of. Thanks for sharing the beautiful libary pictures. I particularly liked the libraries with the lofts! It's LOVE I tells 'ya! How cool is this to look at? Emailing your link to a buddy of mine. So many georgous spaces. I have just completed redoing my library/media room...I love being surrounded by books. The storage under the staircase is a brilliant idea. Oh, I liked that "tucked away" one - wouldn't be lovely to go and escape in there for hours? Beautiful! 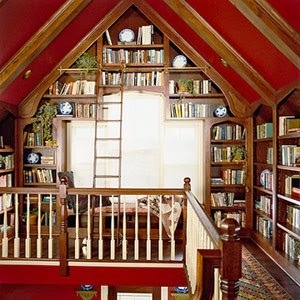 I would love to have a loft library - that would be wonderful :) The little shelves hidden in the staircase are very pretty too! That second picture is just amazing. A girl can dream! Love each one, I think the second one is my fave! Fantastic spaces... What a brilliant idea of using the space under the staircase.... ! !